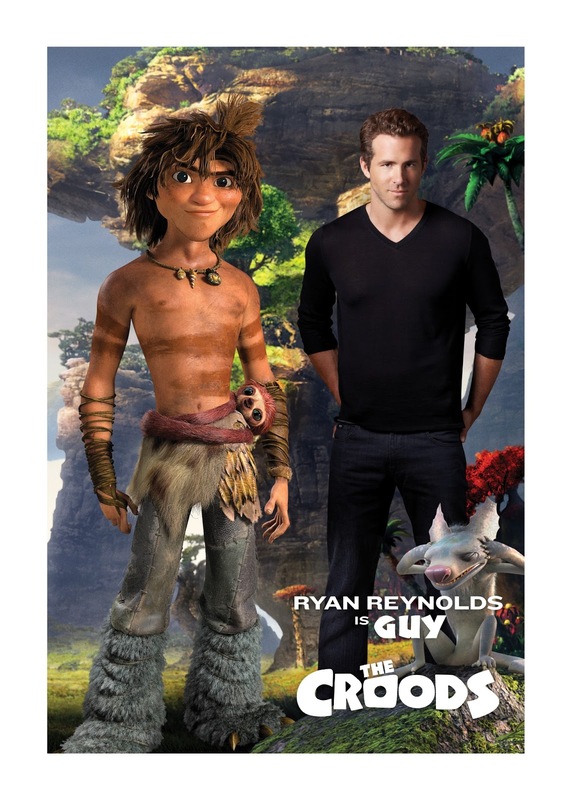 Dreamworks’ latest animated family adventure “The Croods,” (3D) takes us along on their journey where the trek opens up to a lot of discovery. The Croods headed by their patriarch Grug (Nicolas Cage) along with his wife Ugga (Catherine Keener) and kids Eep (Emma Stone) and Thunk (Clark Duke) and baby Sandy plus a feisty Gran (Cloris Leachman) have always been under the shelter of dark caves, always rushing inside when the sun starts to set. With any journey comes discovery – and “The Croods’” trek provides many “firsts,” including: the first family road trip, fire and shoes, as well as the first pet, the first cell phone …plus: the first joke, the first pair of sunglasses, and even the first mid-life crisis. “Guy is also forced to rely on his imagination, so he lives inside his head a lot,” Reynolds continues. “And that’s a great thing to play because he can be as over the top as you want him to be. Guy has no limits because he’s constantly thinking.” Even with his superior mind, Guy needs the Croods’ companionship, and to feel like he’s part of a family. I would describe Guy as a pretty lonely guy. He's a character that's been on his own for so long that a lot of his social skills have atrophied to some degree. He needs the Croods in much the same way as the Croods need him - they each have something that they're desperately missing in their life and they need some kind of catalyst to move them forward. They create the family that Guy yearns for and he has a sense of belonging with them that he didn't have before. For them Guy is a key evolutionary step - they need to move forward or die, and he’s the man that can help them do that,” Ryan enthuses. “The Croods” (in 3D and 2D) opens March 22 in theaters nationwide from DreamWorks and 20th Century Fox to be distributed by Warner Bros.